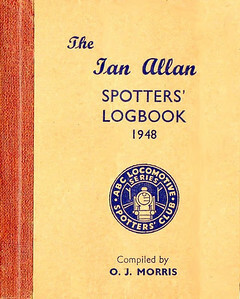 The Ian Allan Locologs/Loco Logs were produced from 1948; although two editions were published in 1946/47 by Morden Meccano Club in conjunction with Ian Allan, who lived nearby; Ian Allan advertising occupied the rear covers of both booklets. To all intents & purposes, this was just an organised notebook (with some interesting facts & figures thrown in for good measure) for one to note one's spotted trains (or buses & cars in the 1947 MMC edition) with an attractive Ian Allan ABC cover. Many thanks to John Debens for several of these scans, and ALL information for this collection. 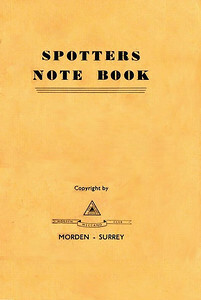 1946 Spotters Note Book, produced by Morden Meccano Club in conjunction with Ian Allan, who has his Locospotters Club advertised on the rear cover. 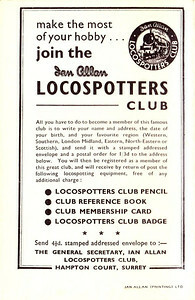 1946 Spotters Note Book, back cover, showing the advertisement for the Ian Allan Locospotters Club. 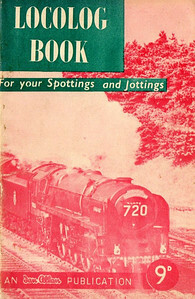 1947 Spotters Note Book, produced by Morden Meccano Club in conjunction with Ian Allan, who has his Locospotters Club advertised on the rear cover. Price 6d. 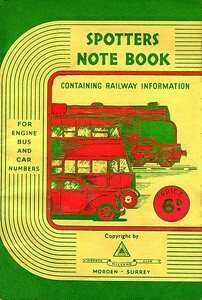 Quote: 'containing railway information; for engine, bus and car numbers'. 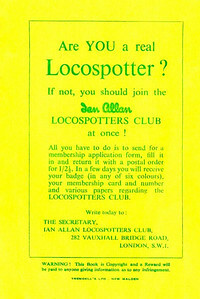 1947 Spotters Note Book, back cover, showing the advertisement for the Ian Allan Locospotters Club. 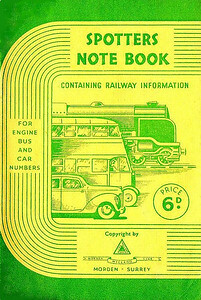 1948 Spotters Note Book, produced by Morden Meccano Club in conjunction with Ian Allan, who has his Locospotters Club advertised on the rear cover. Price 6d. 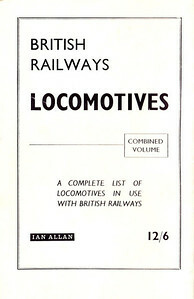 Quote: 'containing railway information; for engine, bus and car numbers'. 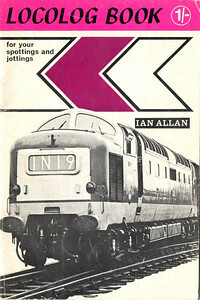 1948 is an educated guess, produced before the first 'proper' Ian Allan Spotters' Logbook. The rear cover is the same as the previous photo. 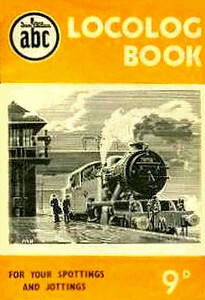 1948 Spotters Logbook, compiled by O J Morris, published January 1948, hardback, with brown GWR spine binding. No price marked, but evidence has just come to hand which points to it costing 2/4d.. First official Ian Allan Logbook, with foreward by O J Morris and Ian Allan. It's quite likely that this particular edition was produced with a spine binding in colours to match all of the 'Big Four' railways, although so far only brown and green have come to light. 1948 Spotters Logbook, compiled by O J Morris, published January 1948, hardback, with green SR spine binding. No price marked, but evidence has just come to hand which points to it costing 2/4d. 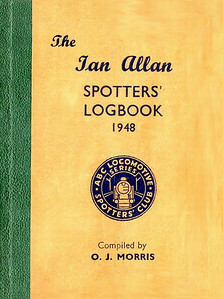 First official Ian Allan Logbook, with foreward by O J Morris and Ian Allan. It's quite likely that this particular edition was produced with a spine binding in colours to match all of the 'Big Four' railways, although so far only brown and green have come to light. 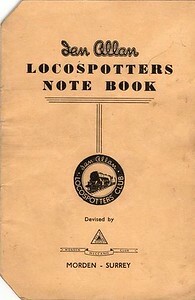 1949 Locospotters Note Book, published 1949. 'Devised by Morden Meccano Club'. Note the new Ian Allan badge logo. 1951 Loco-Log Book, published November 1951, price 6d. 1953 Loco-Log Book, published July 1953, price 7d. The 1953 books were produced in colours to match the six regions, although there are subtle colour differences in some cases. This is the chocolate brown Western Region edition. 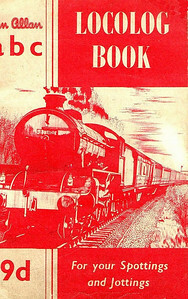 1953 Loco-Log Book, published July 1953, price 7d. The 1953 books were produced in colours to match the six regions, although there are subtle colour differences in some cases. This is a brown Western Region variation. 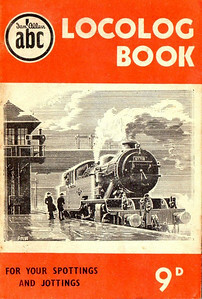 1953 Loco-Log Book, published July 1953, price 7d. The 1953 books were produced in colours to match the six regions, although there are subtle colour differences in some cases. This is another of the SR green examples, only darker. 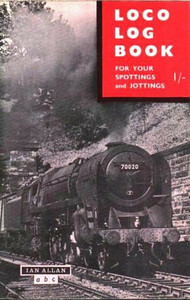 1953 Loco-Log Book, published July 1953, price 7d. The 1953 books were produced in colours to match the six regions, although there are subtle colour differences in some cases. This is (presumably) one of the lighter SR green examples. 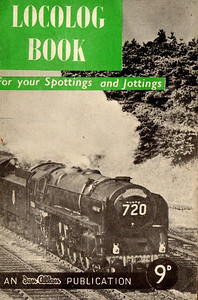 1953 Loco-Log Book, published July 1953, price 7d. The 1953 books were produced in colours to match the six regions, although there are subtle colour differences in some cases. This is the red LMR edition. 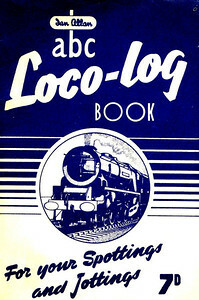 1953 Loco-Log Book, published July 1953, price 7d. The 1953 books were produced in colours to match the six regions, although there are subtle colour differences in some cases. This is one of the light blue Scottish Region examples. 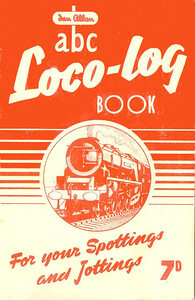 1953 Loco-Log Book, published July 1953, price 7d. The 1953 books were produced in colours to match the six regions, although there are subtle colour differences in some cases. This is the dark blue ER examples. 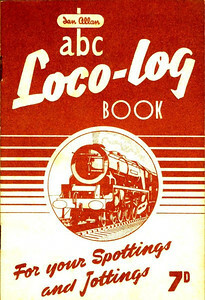 1953 Loco-Log Book, published July 1953, price 7d. The 1953 books were produced in colours to match the six regions, although there are subtle colour differences in some cases. This is the tangerine NER edition. 1952 Locolog Book, price 9d. Cover drawing by A N Wolstenholme of an ex-LNER L1 Class 2-6-4T, This run was produced in a variety of colours, this is the dark yellow example. 1952 Locolog Book, price 9d. 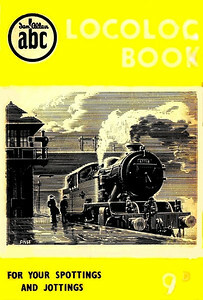 Cover drawing by A N Wolstenholme of an ex-LNER L1 Class 2-6-4T, This run was produced in a variety of colours, this is the light yellow example. 1952 Locolog Book, price 9d. Cover drawing by A N Wolstenholme of an ex-LNER L1 Class 2-6-4T, This run was produced in a variety of colours, this is the green example. 1952 Locolog Book, price 9d. Cover drawing by A N Wolstenholme of an ex-LNER L1 Class 2-6-4T, This run was produced in a variety of colours, this is the red example. 1952 Locolog Book, price 9d. Cover drawing by A N Wolstenholme of an ex-LNER L1 Class 2-6-4T, This run was produced in a variety of colours, this is the orange example. 1952 Locolog Book, price 9d. Cover drawing by A N Wolstenholme of an ex-LNER L1 Class 2-6-4T, This run was produced in a variety of colours, this is the orange example, but this cover has a blue tinted drawing instead of black. 1952 Locolog Book, price 9d. Cover drawing by A N Wolstenholme of an ex-LNER L1 Class 2-6-4T, This run was produced in a variety of colours, this is the pink example. 1956 Locolog Book, published September 1956, price 9d. 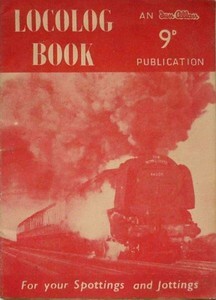 Cover shows a B1 Class 4-6-0. 1957 Locolog Book, price 9d. This is the edition with dark green text backing and red photo. 1957 Locolog Book, price 9d. This is the edition with red text backing. 1957 Locolog Book, price 9d. This is the edition with green text backing. 1957 Locolog Book, published January 1957, price 9d. Cover photo of 'Coronation' Class Pacific 46255 "City of Hereford". Produced in two colours, red and mauve; this is the mauve edition. 1957 Locolog Book, published January 1957, price 9d. Cover photo of 'Coronation' Class Pacific 46255 "City of Hereford". Produced in two colours, red and mauve; this is the red edition. 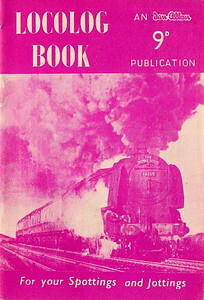 1964-1969 Loco Log Book, price 1/-.. No earlier than late 1964, as there is a refernce to the last of the 'Coronation' Pacifics having been withdrawn in 1964, and no later than 1969 - the last year thar the combined volume was priced 12/6 (advertised on rear cover).., At least two editions were produced during these years, with different advertising on the rear cover. although the front is identical (see following two photos). 1962-1967 (?) 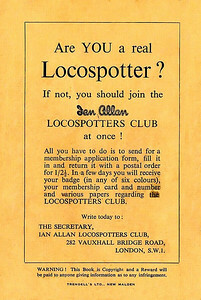 Loco Log Book, price 1/-, rear cover #1, advertising the Ian Allan Locospotters Club. 1962-1967 (?) 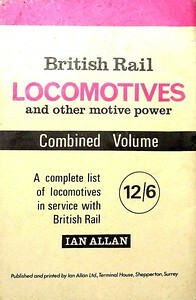 Loco Log Book, price 1/-, rear cover #2, advertising the Combined Volume; it should be noticed that the price of the Combined Volume remained stable at 12/6 (as advertised here) from the Winter 1964 edition until 1969. 1966 (?) Locolog Book, probably published 1966, 24pp, price 1/-. The last Locolog book, with a cover photo of a 'Deltic' Class diesel. Two variations exist: one has the inner front cover advertisement printed in black, the other in blue. See also the next photo for a more detailed explanation. 1966 (?) Loco Log, rear cover. I'd previously had this listed as being 'early 70s', but this advert provides different evidence:- the Combined Volume cost 12/6 from Winter 1964 through to the 1969 edition; the 1970 edition (published in December 1969) cost 15/-, subsequent editions were all variously priced in decimal currency. Photos of steam locos are included here, and referred to in the present tense, and the latest date given on any photo is September 1965. Effectively, this Loco Log COULD have been published any time between early 1966 and the demise of steam in 1968; my educated guess would be 1966.